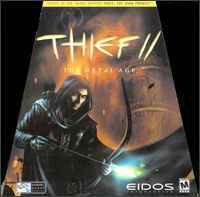 In this sequel to Thief: The Dark Project, the master thief - and the last effort from Looking Glass before their (to me) very much mourned closure. The graphics engine has not changed substantially (now it can be safely called weak), for there are numerous steam powered robot opponents. There are hardly any dungeon levels. This time everything takes place in 15 (quite difficult) levels in the town, in villas, warehouses, banks etc. The Metal Age also brings about the use of changed equipment. Now a small camera can be placed to keep certain places in view. There is a very expensive invisibility drink (which does not hide, however, the noise of your footsteps). Also you can render opponents unconscious. Extinguished torches are sometimes lit again (in this respect one of the watchmen that notices this will have matches carried). Indeed, the guards still do not note if a companion from their rows has disappeared, however, if that would be the case then the game would be probably barely able to be solved. The story will progress through the use of atmospheric films (with partly also still pictures) and holds again some surprises. This is a smooth successful continuation but unfortunately also the degree of difficulty increases again.